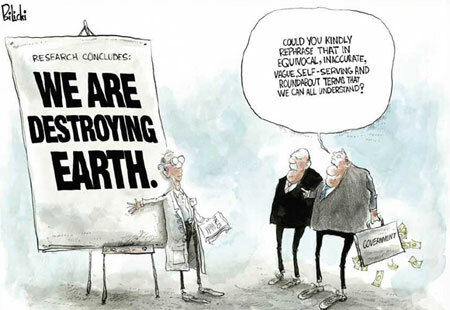 The Union of Concerned Scientists recently announced the winner of their 2008 “Science Idol: Scientific Integrity Editorial Cartoon Contest”. The contest is designed to help focus attention on the “growing problem of political interference in federal government science”. This year’s “Science Idol” is Justin Bilicki of Brooklyn New York, who drew the winning cartoon pictured above. The original water color of the cartoon is being auctioned off with all proceeds going to the Union of Concerned Scientists. All 12 finalists in the contest will contest will comprise UCS’s 2009 Scientific Integrity Cartoon Calendar. Documenting political interference in science is an important task of the UCS. They make their research easily accessible to the public with their A-Z Guide to Political Interference. UCS conducts a variety of survey of federal scientists, including scientists at the beleaguered EPA, to help document this interference. The UCS also makes available tools for scientists and non-scientists to further promote scientific integrity. this a good website and useful for children who like cartoon and science.I had a competition on scie toons this site was very useful for me thanks to the kid who made it.